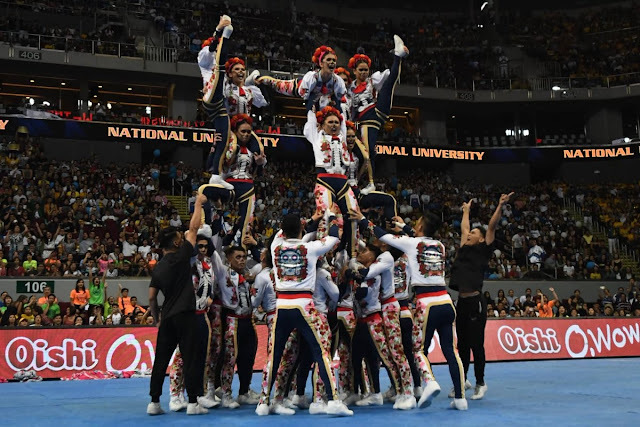 National University climbed back to the top after emerging victorious at the 2018 UAAP Cheerdance Competition held at the Mall of Asia Arena on Saturday. The NU Pep Squad won four straight titles from 2013 to 2016, but failed to continue their winning streak last year. This time around, they staged a strong comeback by pulling off a flawless performance inspired by Mexican Day of The Dead. As champion, the NU Pep Squad bagged the Php 50,000 cash prize, while second placer Far Eastern University Cheering Squad — serving up funky '70s vibes — received Php 30,000. Last year's champion, Adamson Pep Squad, finished third with their 'Lion King'-inspired performance, taking home Php 20,000.